Welcome back to Workout Wednesday! I call it a hotel room workout, but it can easily be done in any situation where you’re simply short on space: staying with family, in a dorm room, on lunch in your office, etc.! You won’t need much equipment for this workout – just a hand towel, t-shirt, or similar. Complete as quickly as possible! Prepare: Set your hand towel or t-shirt nearby so it’s ready to use later. Don’t let your head/shoulders or feet touch the ground between crunches! Mine do in the gif because it loops from the beginning. Great idea for when we’re traveling! Getting that work out can be tough on the road! Love the style of your workout gear. You are definitely motivated to workout while away from home. I need to start that too! These are great tips, I am always looking for ways to integrate exercise while I am traveling. You make me wish I could workout!! Great workout. As a mum I struggle to find time to workout but really know I should. This one seems like the perfect one that I could do in my living room. Thanks for sharing. Those are adorable workout clothes! I don’t spend too much time in hotels, but the last time I was in one, I walked into their fitness room, saw all the people, and left. I’d much rather work out alone. Thanks for the inspiration! This couldn’t have come at a better time, I’ll be in a hotel all next week! Thank you! Omg this brings me back! I modeled when I was younger and was all about the hotel room workouts! Cute workout clothes! I was a roller skater for years as a teen and early 20s like figure skating. I think my husband wishes I’d go back and become a rollergirl, too, lol. No way! That is so cool. WOW! You look amazing! Your ARMS! I want! This workout actually looks like something I can do. Thanks for taking the time to create and share the videos. I never thought about working out with a towel or pillow. Great new exercise for me to try. Love it – I’ve saved the exercises to do while watching TV at home – and Iron Doll and you both look marvelous! I’ve been jogging to lose my 5 pounds – now I do need this – thanks! I want to have that hoody also! These moves are very cool, I wanna try it now even if I’m not in a hotel lol. Those exercises may just work in my living room since it is so tight in there. First off, those capris are freaking adorable! Secondly, I lived in a hotel for over a week a couple of months ago and working out in the room was the only thing that saved my sanity! What a great way to keep in shape while traveling. I like that you can use in your hotel room in case you dont have time to visit the hotel workout center. The Burpee sun salutations are my favorite! I mean, I hate regular burpees but those look cool. These are awesome tips for people with not a lot of space in their homes as well 🙂 Thanks! Working out when you are out of town. Wow! No wonder you are in such a great shape! More power to you! I can’t even keep up with my workouts at home 🙁 Really happy to see people succeed in workouts even on travels! It can’t be this easy! Seriously you are awesome. I love that to work out in a hotel you don’t need to pack much extra that’s great! Well a hotel workout means NO EXCUSES now! I love it! Also I’m glad you shared about your outfit because I was going to ask in the comments where I could buy it! I need a pair of those kaleidoscope capris! They are too cool. Great tips for working out while travelling! I really like your outfit! I’m one of those who finds tons of excuses to skip exercising while traveling. It’s good to know that there are so many different exercises that need almost no equipment. You really make this look so easy! Haha Thank you for your inspiration and drive to keep us going! I love a great Workout Wednesday! I just started running again this week when I drop my son off at the bus and am doing some yoga today! I am SO NOT a fan of burpees or crunches, but the rest of these exercises I could handle! I adore those colorful workout pants!! The kaleidoscope capri pants are so pretty! I also love the racerback hoodie is so cool. Irondoll does have nice athletic wear. I just wish I was that athletic! All good tips and I appreciate being able to see the form in the moving gifs too. This post is proof positive that you can (and should) work out anywhere! Great workouts with my sister at our house you don’t need any equipment. I think need to workout again. Nice tips shared!! I also love home workout but never able to do in regularity because of time constraints!! Oh these are great for home too. I love the pillow pass abs one! It can be so difficult to keep working out on schedule when traveling! This is a great tip for those on the go! I’m glad I cam across this workout! I have two trips in the next month and this is doable before I head out for my day of conferences! Hats off to you! Great overall list of exercises! I’m jealous since I can’t exercise anymore after 2 back surgeries! But ur killing it! Way to go! This is awesome! I’m definitely saving this for the next time that I head out of town. Great ideas! I never think about working out when I’m away from home but you make it seem so doable. Love your clothes too! Working out in a hotel would be hard. But you are determined! This just proves that you can work out on the go. Great ideas and tips! I actually need this really soon! Thanks for sharing! Those burpees look killer. I am not sure those would be on my list. What fun and easy workouts. Plus your clothing is GORGEOUS!! This is great. So many people stop their workouts when they travel and this proves that they don’t need to! Good gravy, you look amazing. I love the animated pictures, makes me want to stand up and do something myself!!!! Chanelle I always love your articles! Your videos make it super easy to understand what I need to do! I will be staying in a hotel for a few days in October so this is awesome thank you! Yay! You’ll have to let me know if you try it out! This is a great workout if the hotel you are staying at doesn’t provide a fitness area. I like the funky patterned workout pants. That’s what most of us girls wear to my Zumba and Hip Hop classes. Much more fun than solid colors, for sure! I love this, never thought to work out while at a hotel room. Perfect way to continue your workout routine while traveling! Nice routine. Going to pass this on to my son, he goes to college in 2 years, so it will be perfect for him! These are all awesome suggestions! I don’t travel very often but when I do it usually means I am eating more than normal too and could really use a workout. I wish I cared enough to actually do a workout in my hotel room when traveling. What a great workout! I am going to go back in pin this under travel tips! I love that the two of you are working together now. I wish I could talk my daughter into it. Some really great workout suggestions and tutorials. Love that you aren’t suggesting a health club or expensive weight system…and your ideas can be done at home or traveling. I should be doing this at home. Or get back to the gym! Woohoo! Let me know how it goes! These are the best workout videos! I wish my mid-life body was in shape, like it was in my 20s! You are so motivating, tho! Perhaps some slow yoga for us middle-aged moms, LOL! We have a super small house, so these exercises will work out well for my home. I love the colorful outfit from Irondoll. What a great workout for tight spaces. I will keep this in mind next time I travel. This is a good group of core exercises. The workout does a nice job of hitting all the major muscle groups. Those workout clothes are just adorable! I tend to stick to neutrals or solids, but why not rock the bold prints too? I’m loving the hoodie too! I wouldn’t have thought about using my workout gear for travel, but it’s so comfy that it’d be perfect. The workouts sound great for us on the go. I just hope the sound of me grunting and struggling to do more crunches doesn’t freak out my hotel neighbors. Those look like great exercises that you can do anywhere too! Staying in shape while traveling! Hopefully they’ll help me work off some of the yummy foods I eat while I’m on the road. I’ve really been enjoying your workout series. There’s usually one or two exercises I haven’t seen before. I love all of your workout outfits so much! And you have me inspired to work out again the next time I go to a hotel! This workout looks like it really works the core. These are some great exercises to do while on the road. Useful workout for when we are on vacation! Thanks for sharing! This is such an awesome workout!!! My hubby is giving up his half of our garage for my bike trainer, elliptical and yoga mat, so I am going to have my own workout space, but it isn’t huge- being able to workout with just myself and a bench is going to be killer! …and I obvi need the raceback hoodie. LOVE IT! Like that hoodie. These exercises are great and would be fantastic inside during bad weather. My abs and legs are hurting just watching those gifs, lol Seriously, this is proof that you don’t need fancy equipment to get a good workout in—even when traveling! You are welcome and I’m glad you’re digging them! I like the idea of working out while travelling. Great post. I just need some motivation when I am traveling. I might use the hotel gym though. Good job! I love your leggings! Love that sweatshirt/shirt, whichever it’s called lol. That would be really nice, to wear around the gym. Great workout! Thanks again for actually showing how to do the exercises. That makes it so much easier to imitate the moves. 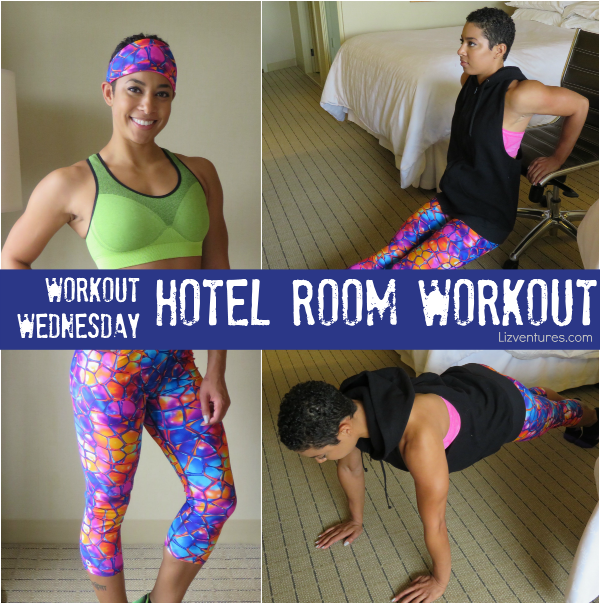 Love the idea of a hotel room workout with how much I travel! I love that outfit the colors are great! I love that you added gifs to show the moves! That’s really helpful. Sometimes stationary pictures just aren’t enough. If I looked that cute working out then I’d be doing this every day! I do love the workout outfit you chose as some how when you look bright and festive you feel better. I live in a two room cabin so I could use your hotel workout in my house. That’s awesome! It just shows you really can do your exercises anywhere. I like the one you did with the chair. This would be a nice quick workout while you’re on vacation. At least you won’t feel too guilty about eating too much food. It is so hard to find space and time to workout when we a travelling from place to place. This looks like a great option for those of us who want to maintain a workout without having to trek down to the gym at the hotel. You are famous by proxy. What great tips for using what you have. This is perfect for if the hotel doesn’t have a gym or you just want to skip it. This article is pretty great. Staying in hotel rooms or family guest rooms can definitely put a damper on your workout routines. And losing momentum for some people can be unfortunate. Great article! Great suggestions! Last time I was at a hotel, I had forgotten my workout clothes, so I couldn’t go down to the gym. Now I know I don’t need to! This I could do in my PJ’s! Those are nice workout clothes you are wearing. I don’t think I have to repeat my thoughts on exercising in a hotel room or elsewhere!! Thanks so much for sharing this. I love to travel, but I always feel like I can’t get a workout in. This is great! These are such good suggestions for when you’re limited on space! I don’t have to make time to get to the gym to get a workout in. You’re completely right that it’s just as easy using the space you’re in…I really need to do crunches with a cross fit punch! You are supposed to slack while vacation ;). I actually never thought of doing this on vacation, but these are great suggestions of what to do when on vacation! You keep me motivated. This post is genius! Especially with the gifs so we can make sure we are doing the exercises properly. Travel always throws a wrench in my workout routine. Love the clothes too! Love the styles of the Iron Doll Clothing. Going to check it out as my sister would love this as a gift.Thank you for the tips on exercising while away. I don’t know that I’d recommend doing any kind of press with a chair on wheels. Looks like a recipe for getting hurt! True, but had to work with what I was given! Air squats is something I really need to try with my thunder thighs! What a great line up of exercises! Sometimes I just don’t want to go to the hotel gym, so these exercises would be perfect when I’m traveling. I would have to modify the pushups to girly pushups. 🙂 Your outfit is awesome! This is also perfect for me because I don’t go to the gym. I walk and workout at home. The chair dip looks the toughest to do. I will try these moves. I don’t think I can do this during vacation. I do a lot of walking though.